For more than four decades, he’s served as the city’s top watchdog, crunching budget numbers and analyzing spending reports in the shadow of four mayors. 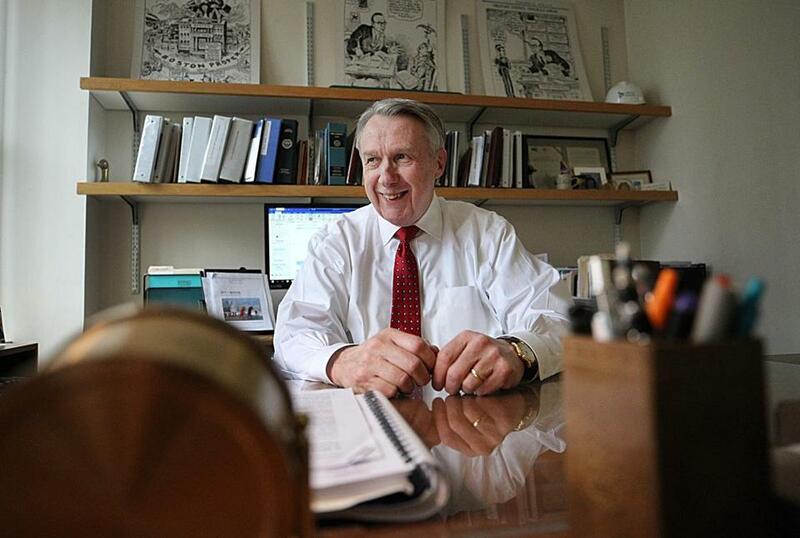 Samuel R. Tyler, the president of the Boston Municipal Research Bureau, said Tuesday that he will retire from the post where he’s shaped city policies ranging from the financial intricacies of its pensions to the composition of the School Committee. The bureau was established in 1932 as the only independent, nonprofit watchdog of its kind that would aim to inform the city and analyze its policies. Tyler, 72, has worked for the organization for more than half its lifetime, including the last 36 years as president. “I’m very grateful for all the contributions he has made to the city of Boston, and wish him all the best in his retirement,” Walsh said in a statement. Tyler said the city is in far better financial shape that it was four decades ago, with repeated perfect bond ratings. The city’s pension and retiree health liabilities are funded. But he also said it took years of reform to secure city finances, and praised the bureau for its analyses and influence. That includes its analysis in the early 1980s of Boston’s strong mayor form of government, amid efforts to weaken former mayor Kevin White’s authority to seek bonds to pay for court-ordered abatements. White had been under federal investigation at the time, and city councilors sought to attack his credibility, but policy makers worked off of the bureau’s studies to approve the issuance of the bonds. When Raymond Flynn was elected in 1983, the bureau conducted an independent study that identified new revenue streams beyond property tax and state aid. Though not going as far as Flynn wanted, the bureau identified room occupancy and jet fuel excise taxes the city could collect, and “they were the first new revenues made available to Massachusetts cities and towns in a decade,” Tyler said. “That was a significant achievement. We were just one of the players in there, but played an important role,” he said. In the early 1990s, the bureau’s examination of the structure of the School Committee drove the effort to make the panel an appointed board, “holding the mayor accountable for education in Boston,” Tyler said. And the bureau’s examination of the 1996 merger of the former Boston City Hospital into what is now the independent Boston Medical Center helped influence a decision that saved the city resources, while maintaining health care for area residents, Tyler recalled. Tyler said the improvement of the city’s finances over the last several administrations has allowed it to focus on other, pressing matters, such as addressing climate change, and social and economic equality. “Some of the other issues that haven’t been addressed in the past are now being addressed,” Tyler said. Tyler said the timing is right for someone else to lead the bureau. He announced his planned retirement to the bureau’s board of directors on Tuesday and will officially step down at the bureau’s annual meeting, on March 7. Pam Kocher, who was tapped two years ago as the bureau’s vice president of policy and research, is slated to be elected president. Tyler, who raised three sons with his wife Phyllis, said he had no immediate plans, but hoped to stay involved in policy making. A native of Massachusetts, he holds a graduate degree from Northeastern University, and, except for a year teaching at Arlington High School, has spent his entire working career at the bureau. “I leave the bureau, but I hope to stay involved, and find some other passion that I can get involved in. I’m not ready to hang it up all together,” he said.